Thoughts pour in; they swirl, forming a current, pulling more thoughts into the depths, growing tumultuous. They darken and become dangerous. I am caught, swept in by the undertow. It’s loud and I can’t escape. I try to distract myself with other people’s stories, but more words and information makes it worse. I resent the people on the other side of the screen. I say to myself, “wherever you go, there you are,” but I start my car anyway. Outside city limits, traffic thins until I am alone on the road. I slow my pace, enjoying the view: farmhouses, oak trees, cattails growing from wet earth. I crest over a bend to see a wide open sky and rolling hills. A lake rests between peaks. I arrive at the Buttermilk Bend trailhead. Signs announce Wildflower Tours at 11:00 am. It’s evening now, but I know I’m in the right place. I step onto the trail; the noise inside my head fades, replaced by the sound of the blue green river. 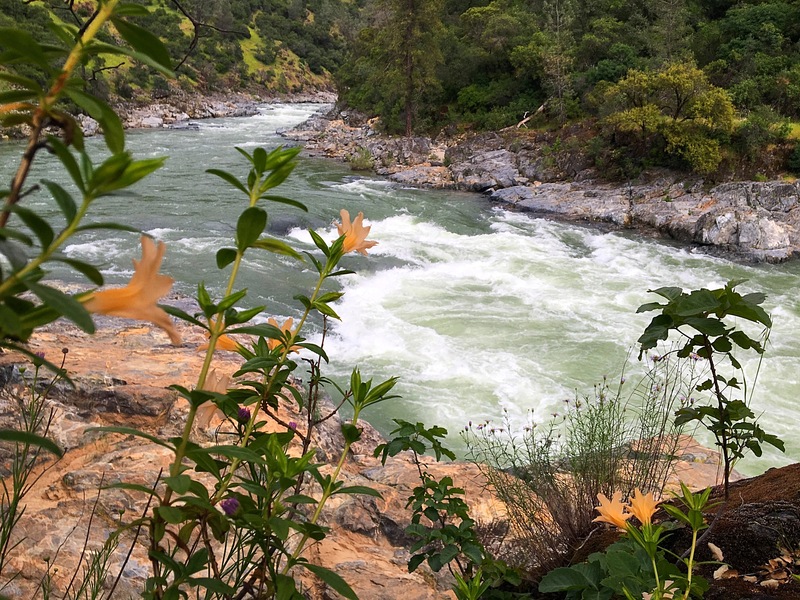 The Yuba rushes below me, through a valley she’s carved between foothills. I look into her. I see myself in her water; I am made of her, but she is greater than I. She is a force of life — mother to creation. She brings me back to myself, calling to her essence within my veins. I am not the dark and stormy waters of my mind; I am the observer of a free flowing river. The trail follows the river’s path. We turn together. Curiosity ebbs and flows with the bends. 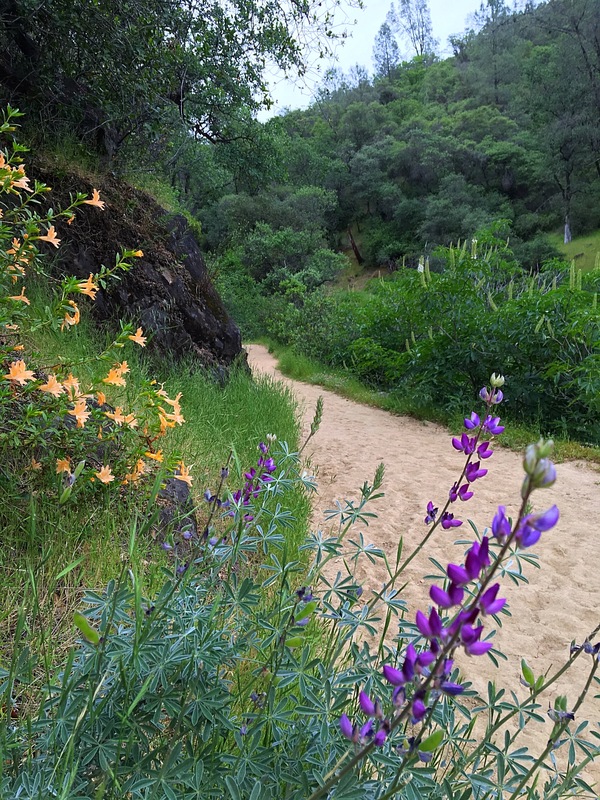 Wildflowers line the path in blues, yellows, whites, purples, reds. They are compact, expansive, delicate, broad, intricate, simple, in boxes and in circles, fragrant and without scent. My plugged-in lifestyle, the one that makes my head loud, is like eating plastic information out of plastic bags; I scroll through photos that have been altered; I read inane comments; I watch videos of people pretending; I question every news article, every statement; the part of my life that is lived through squares plugged into outlets makes me forget my true nature. Wildflowers are a simple joy. When I see them, I feel a softening in my heart, a growing tenderness, an up-swelling of pleasant emotion. The river sounds like the river primordial. It speaks the language of my soul. It washes my mind of the chaos and clutter I’ve accepted into it. Nothing to plug in, no buttons to push, nothing to sell or buy. 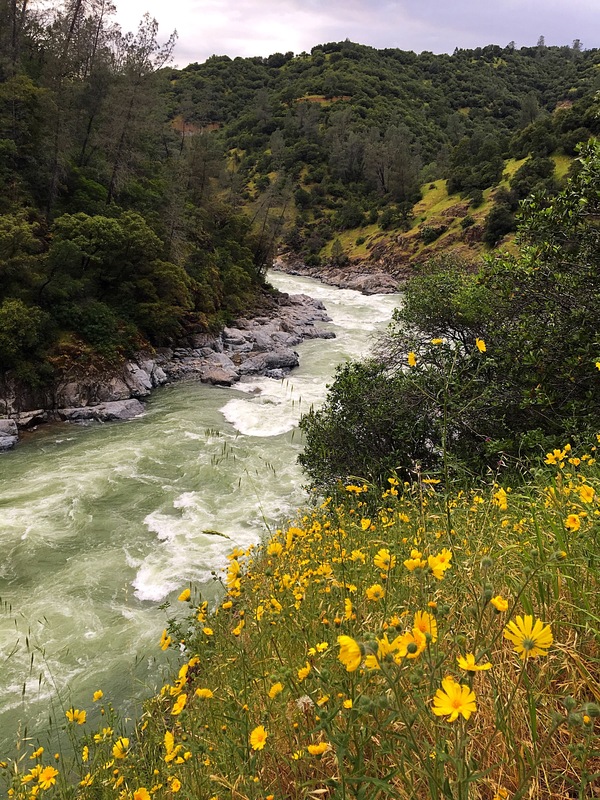 Amongst the wildflowers, next the river, I come back to myself — the pure, unaltered state of breathing and living.